Twenty-three years after the execution of a playwright, environmental activist and Ogoni leader, Ken Saro-Wiwa, his kinsmen on the platform of the Movement for the Survival of the Ogoni People (MOSOP) says it is becoming increasingly clear that the Nigerian government is not bothered about the genocide against the Ogoni people in the country. It was exactly 23 years last November 10, since Saro-Wiwa and eight of kismen were allegedly executed brutally by the Nigerian government under the leadership of the late Head of State, General Sani Abacha. They were sentenced to death by a special military tribunal set up by Abacha who later died in June 1998 inside the Presidential Villa, Abuja, under mysterious circumstances. Saro-Wiwa mobilized the Ogoni people to rise against oil pollution by the Anglo-Dutch oil and gas major, Shell, and the continuous degradation of the Ogoni land by the government-backed Shell. The big oil is facing a civil suit in the Netherlands over her alleged complicity in the killing of Saro-Wiwa and the eight other Ogoni activists. The suit was filed on June 28, 2017, by four of the widows of the Ogoni Nine, led by Esther Kiobel. As part of efforts by the Federal Government to build trust with the Ogoni people and other people in the environmentally despoiled oil and gas region, the Niger Delta, the Vice President Yemi Osinbajo, toured the oil-bearing communities in 2017 and had interactions with the people affected by long years of oil exploration. In Benin City, the Edo State capital, in March 2017, he said, ”I can tell you how many of these projects are supposed to have been completed, and when you looked in the books, they say they have been completed. But they have not been completed. They haven’t even been done. Many have not even been started at all. ‘’It does not make sense for leadership not to look at the plight of the people, especially in the oil-producing areas. This is the source of the wealth of the nation. Even if you ignore the people for a while, a time will come when you can no longer ignore them. However, speaking in Bodo, Gokana Local Government Area of Rivers State, MOSOP President, Fegalo Nsuke, said the Nigerian government does not care about the poor living conditions in Ogoniland. While accusing the government of using the Ogoni cleanup programme to deceive the people, he alleged that the real intention of the government was to resume oil production in the area without the consent of the Ogoni people. ‘’It is pitiable to find that all Nigeria is interested in is the Ogoni oil and gas and definitely not the people.’’ The MOSOP President also said that the cleanup program under HYPREP had been shrouded in secrecy. He maintained that HYPREP is corrupt and not implementing the UNEP report on Ogoniland. Lamenting on the alleged neglect of the Ogoni people despite their enormous contributions to the economy of Nigeria, the group said ‘’in over 50years, Shell and the Nigerian government have polluted Ogoniland, our land and resources have been carted away to the detriment of the Ogoni and to the advantage of the rest of Nigeria. This is really a sad story and a very ugly side of our national history which I expect the Nigerian government to quickly address instead of chasing the Ogoni oil like people without conscience’’. Nsuke also condemned the militarisation of Ogoniland and the extra-judicial killings which has characterized the presence of the security forces in Ogoniland citing the recent case of the shooting of a Polytechnic lecturer, Dr Ferry Gberegbe, in Bori. While calling for an immediate investigation into the killing of Dr Gberegbe and others, Nsuke described the involvement of the Nigeria Police in the shooting of defenseless and innocent Ogoni citizens as reflecting Nigeria’s degeneracy and a threat to national unity. 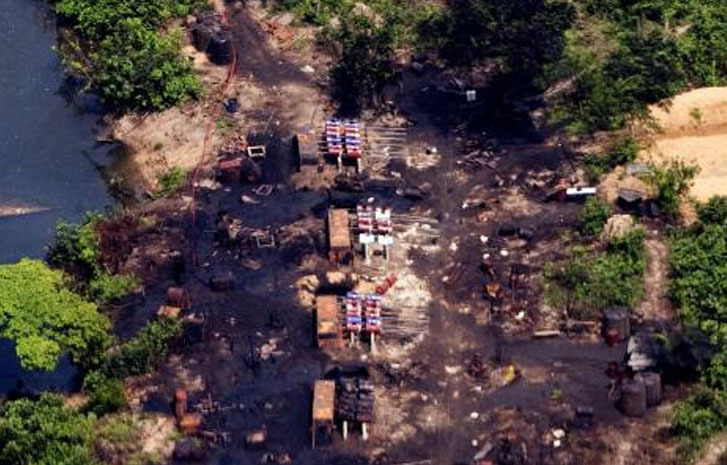 The MOSOP President said the gradual militarisation of Ogoniland only remind the Ogoni people of the evil Shell and Nigeria have done to us in the past which led to the death of over 4,000 Ogonis. “The military only remind us of our loved ones they have killed. It would have been better for our country to negotiate any issues they have with us instead of sending the military whom we only know and remember for the killing of over 4,000 Ogonis” the MOSOP president said. Nsuke said MOSOP was raising this alarm because Nigeria appears to be implementing a policy to kill the Ogoni people, noting that the recent directive to the NNPC to take over Ogoni oilfields was one of such decisions not acceptable to the Ogoni people and the government knows it has not allowed any reasonable discussions on the matter nor has it taken steps to address the demands of the Ogoni people as contained in the Ogoni Bill of Rights. Continuing, he said the failure to allow broad-based discussions with the Ogoni people opens the window for conflicts which the government seem to prefer as it gives them the opportunity to crush our peaceful protects. While maintaining that the struggle of the Ogoni people is justifiable, he charged MOSOP leaders at all levels to educate and mobilise the people to peacefully protest the dangers the security forces now pose to the peace of Ogoniland and resist attempts by the government to trample on the people’s rights.